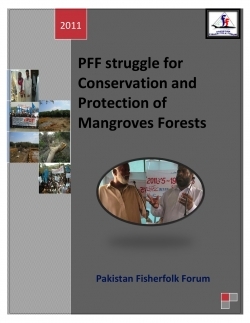 During the last several weeks ESCR-Net has issued several solidarity actions in support of member organization Pakistan Fisherfolk Forum (PFF) who have mobilized in response to the clearing of mangroves and associated land grabbing activities. The mangroves serve as breeding grounds for fish and migratory birds and safeguards against damages from the tides, and several Pakistani fishing communities have reported increased food insecurity resulting from the loss of some 500,000 hectares of mangrove forests due to both natural and man-made causes. The PFF have been the victims of ongoing threats and harassment and several armed attacks, including one that took place at a PFF office and led to the deaths of two PFF leaders. Regrettably the government of Pakistan has, as of yet, neglected to provide the necessary protection or investigate those responsible for the killings. The PFF has recently compiled a report documenting their struggles to defend their lands, their livelihoods and their lives that can be viewed below in its entirety.